Are you looking for a quick recovery tool with deep scan feature? Among the best hard drive recovery software, Systweak's Advanced Disk Recovery tool is quite good for recovering accidentally deleted files in Windows OS. Systweak has various software programs for Windows, iOS, Android and MAC along with the premium data recovery tool for Windows. 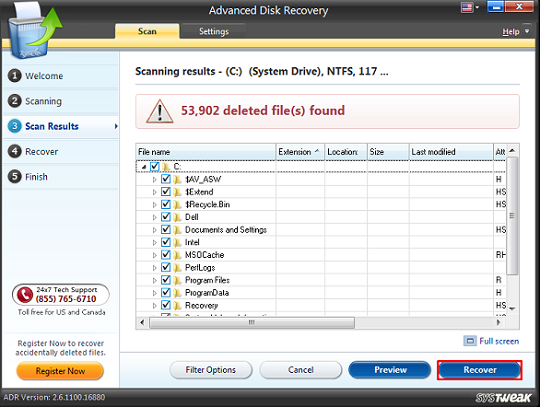 This advanced data recovery tool provides the free deep scan for your system with simple and instinctive web interface. Systweak's Recovery for Windows is a cheap professional recovery tool. To answer about its trustfulness, this is important to say that Systweak is very successful in countries like US & Canada and also providing premium license globally. If you deleted your files mistakenly then this deep scan recovery-software tool can help you to get back those lost files. Systweak's Advanced recovery utility tool can recover all types of files including documents, music and especially the largest videos. 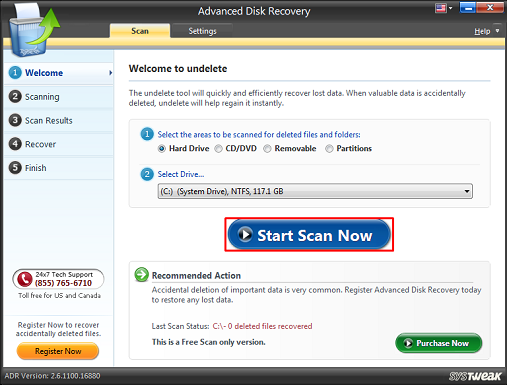 Advanced Recovery tool can recover files from an internal hard drive as well as from CD and DVD. This is the best hard drive recovery tool at the cheapest price of just US $40. When it comes to the price this utility tool is the best value for money recovery software compared to Stellar Phoenix, EaseUS and Recuva. Let's discuss few features for the review of this Advanced recovery tool. Systweak's this advanced tool provides a good user-interface to recover any files quickly. You can minimize the running operation and also can pause and resume the scan at any time. Advanced Disk Recovery offers recovery over multiple file types. Any types of files and folders can be recovered by this tool. This tool can be used to recover even a large file in a moment. Easily restores your deleted data. This tool comes with two scanning options. One is Deep Scan and another is Quick Scan. You can choose either deep scan or quick scan. However, the deep scan finds more files and takes a longer time than quick scan which search the lost file on a basic stage. Systweak recovers files from both internal and external drives. You can recover lost partition and deleted data from any storages. This tool offers CD and DVD storage recovery in an easy and hassle-free way. That is a great feature added in this tool for Windows users. If you need a professional full version tool to recover unlimited accidentally deleted data then Systweak offers this under $40. The best part of the mentioned word 'feature' is, it is the cheapest unlimited recovery tool for Windows. If you are a windows user then buy this at a discounted rate ($30) which is more cheaper than any other tools. 1) Offers cheapest recovery program for Windows OS (Windows 7/8/8.1/10, Vista, XP). 2) External and Internal drive recovery. 3) CD and DVD drive recovery. 4) Lost and Deleted Drive Recovery. 5) Supports all file types. 6) Deep and Quick scan available. 7) Minimizes window while scanning and performing the operation. 8) Saves time due to its pause and resume feature without any loss. 1) Does not have recovery tool for Android, MAC, iOS. 2) Does not provide free recovery limit. 3) Don't have Free version. 4) Missing few options (not so much important). At first, download the setup free and install on your PC. 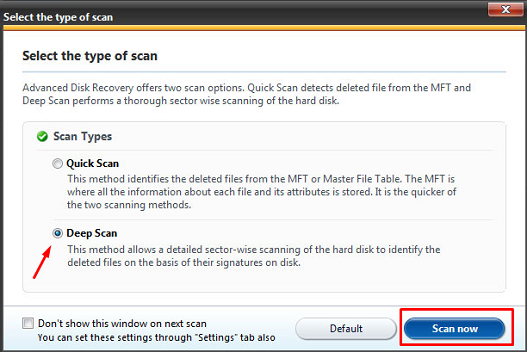 Now open the setup and select the drive you want to recover from and click on 'Start Scan Now' to scan the drive. Now select 'Deep Scan' and hit 'Scan Now' to process. Now all deleted files will be shown up. Select the files from the list and click on Recover to get those deleted files back. This is the procedure for free scanning and to recover you need to buy the license. We would say this tool is free for recovery. However, you can download this tool and scan and view your deleted files totally for free. This tool is our top choice when you need the unlimited recovery at the cheapest price. This tool is perfect for recovering your files. Just you should check the features provided with the tool. Once you are fit in it just go for purchasing Systweak's Advanced Data Recovery tool right now.